Ever had one of those days where you eat lunch and then realize, three hours later in the restroom, that you have a big chunk of something in your teeth? How many people did you smile at or talk to in that three hours? How many noticed and said nothing or made little gestures to clue you in that you completely missed? It’s embarrassing. Well, now there’s an app to save you the embarrassment! Toothpict is a simple little app that lets you alert your friends and (hopefully) let them alert you too whenever something is in your teeth. Just load it up and a smiling mouth graphic appears. Choose an appropriate food chunk from those presented, position it approximately where the offending chunk in your friend’s mouth is, and send them a photo via text message. 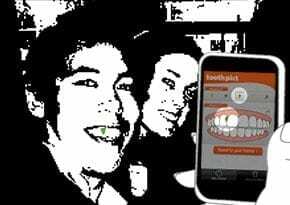 The app also comes with an obvious mirror option so that you can check your own teeth via your phone’s camera. It’s a little awkward to use because of the iPhone’s layout, but it works.